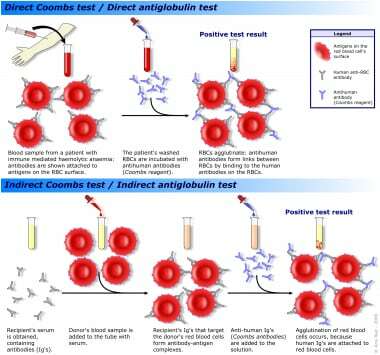 A schematic of the direct antiglobulin test (DAT) and the indirect antiglobulin test (IAT). Courtesy of Wikipedia. There are many causes of a positive direct antiglobulin test. It is important to remember that a positive direct antiglobulin test is neither 100% sensitive nor specific for hemolytic anemia. The clinical significance of a direct antiglobulin test result should take into consideration the patient's clinical history, diagnoses, and other laboratory test results. The patient's developing antibodies will coat transfused RBCs bearing the corresponding antigen, resulting in a positive direct antiglobulin test result. Antibodies appear within 7-10 days after a primary exposure or within 1-2 days of a secondary response. Antibodies can shorten the survival of previously or subsequently transfused RBCs. Maternal alloantibodies are specific for inherited paternal RBC antigens expressed by fetal RBCs. Maternal alloantibodies bind to the corresponding antigen on fetal RBCs, resulting in a positive direct antiglobulin test result. Warm autoimmune hemolytic anemia is the most common type of autoimmune hemolytic anemia and is generally associated with warm-reactive IgG autoantibodies. Three patterns of reactivity may be found on a direct antiglobulin test: IgG alone, complement alone, or both. Cold agglutinin syndrome is associated with cold-reactive autoantibodies, most frequently immunoglobulin M (IgM). In areas of low temperature in the peripheral circulation, IgM binds to the RBCs and causes complement to also adhere to the RBCs. As the RBCs circulate to areas of higher temperature, the IgM may dissociate, but the complement remains. Additionally, the standard direct antiglobulin test will not detect IgM coating of RBCs. As such, complement alone is commonly detected on the direct antiglobulin test. In a patient with mixed-type autoimmune hemolytic anemia, the direct antiglobulin test commonly detects both IgG and C3. Paroxysmal cold hemoglobinuria is caused by a biphasic hemolysin, known as the Donath-Landsteiner hemolysin. This autoantibody is an IgG complement-fixing antibody that reacts with RBCs in the colder areas of the circulation. The IgG causes C3 to bind irreversibly to RBCs; subsequently, the IgG dissociates from RBCs in warmer parts of the body. Thus, the direct antiglobulin test is typically positive only for complement. Drugs can induce the formation of antibodies, either against the drug itself or against intrinsic RBC antigens or the RBC membrane. This may result in a positive direct antiglobulin test result, immune hemolysis, or both. Drugs commonly implicated in this include penicillin, second- and third-generation cephalosporins, alpha-methyldopa, and procainamide, among others. RBC autoantibodies and alloantibodies are usually IgM or IgG antibodies. Pentameric IgM causes direct agglutination in saline-suspended RBCs. By contrast, IgG antibodies adhere to the corresponding antigens on the RBC membrane, but they do not result in agglutination. RBCs with adherent IgG antibodies can be considered "sensitized." Based on work by Coombs and others, it was postulated that, if rabbits were injected with human gamma globulin, they would develop antibodies to the foreign protein, so-called antihuman globulin (AHG). After suitable processing, this AHG would react specifically with IgG adhering to RBC membranes, cross-linking the sensitized RBCs and causing agglutination. Monospecific AHG reagents can confirm which globulins are present. The serum/plasma can be tested to detect and identify clinically significant antibodies to red cell antigens. An eluate can be prepared from the sensitized red cells. An eluate displaces antibody from sensitized RBCs and recovers antibody in a usable form. The displaced antibody is then tested against a panel of reagent RBCs to determine the activity of the antibody. Eluate preparation frequently concentrates small amounts of antibody and may facilitate identification of weakly reactive antibody. When the eluate reacts with all the reagent RBCs tested, the patient most likely has an autoantibody. This is particularly true if the patient has not been recently transfused. Polyspecific and anti-IgG reagents are very sensitive and can detect as few as 200-500 molecules of IgG per RBC. However, patients may experience autoimmune hemolytic anemia when IgG coating is below this level. As such, the direct antiglobulin test (DAT) result be negative despite the presence of IgG-coated RBCs. This entity is sometimes referred to as direct antiglobulin test–negative autoimmune hemolytic anemia. Therefore, even if the result is negative, elution may be performed if immune hemolysis is suspected. What is a direct antiglobulin test (DAT)? Which results on a direct antiglobulin test (DAT) are characteristic of hemolytic transfusion reactions? Which results on a direct antiglobulin test (DAT) are characteristic of hemolytic disease in the fetus and newborn? Which results on a direct antiglobulin test (DAT) are characteristic of autoimmune hemolytic anemia? Which results on a direct antiglobulin test (DAT) are characteristic of drug-induced hemolysis? When is a direct antiglobulin test (DAT) indicated? What types of direct antiglobulin tests (DATs) are commercially available? How are positive direct antiglobulin test (DAT) results interpreted? How are negative direct antiglobulin test (DAT) results interpreted? What are the limitations of a direct antiglobulin test (DAT)? How is a direct antiglobulin test (DAT) performed? Coombs RR, Mourant AE, Race RR. A new test for the detection of weak and incomplete Rh agglutinins. Br J Exp Pathol. 1945. 26:255-66. [Medline]. Silberstein LE, Cunningham MJ. Autoimmune hemolytic anemias. Hillyer CD, Silberstein LE, Ness PM, Anderson KC, Roback JD, eds. Blood Banking and Transfusion Medicine: Basic Principles and Practice. 2nd Edition. Philadelphia: Churchill Livingstone; 2007. 557-70. Petz LD, Garratty G. The serologic investigation of autoimmune hemolytic anemia. Immune Hemolytic Anemias. 2nd ed. Philadelphia: Churchill Livingstone; 2004. 201-230. Segel GB, Lichtman MA. Direct antiglobulin ("Coombs") test-negative autoimmune hemolytic anemia: a review. Blood Cells Mol Dis. 2014 Apr. 52(4):152-60. [Medline]. Judd WJ, Johnson ST, Storry JR. Judd's Methods in Immunohematology. 3rd ed. Bethesda: AABB Press; 2008. Bartolmas T, Mayer B, Yurek S, Genth R, Salama A. Paradoxical findings in direct antiglobulin test and classification of agglutinating autoantibodies using eluates and monospecific anti-human globulin sera. Vox Sang. 2015 Jan. 108(1):58-63. [Medline].